Ryan decided that he wanted to walk the big O for thanksgiving. He got the idea after he had hiked the Florida Trail this past winter. 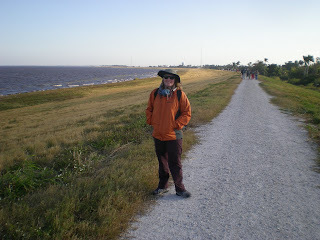 When he went around Lake Okeechobee in Florida, he went around the western side of the lake and missed the eastern side. 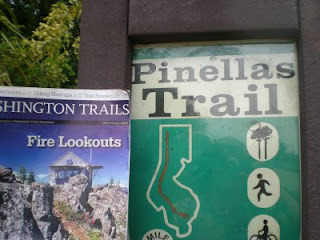 He knew that every year at Thanksgiving, the Florida Trail association hosted a 9 day hike around the lake completing the full 100+ miles and he really wanted to do the whole thing! So of course, what can I say? Of course, honey! 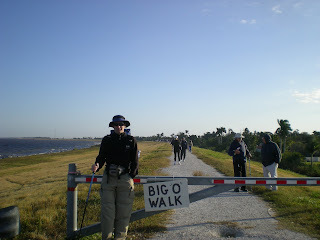 Walk the big O! We flew down to Tampa, Fl where I have relatives and spent one night then we drove on down to Lake Okeechobee so Ryan could begin his walk. 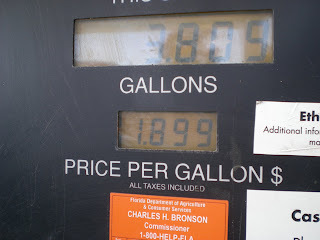 We couldn't help but stop for a couple of letterboxes along the way and we were also excited about the gasoline being less than $2 a gallon in Florida!! 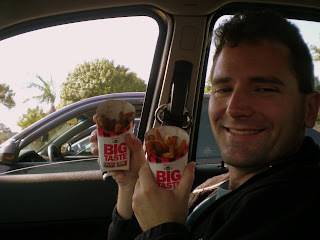 we stopped for lunch at Checkers fast food restaurant so we could be sure to get the best french fries ever!!!! 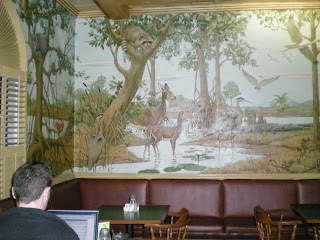 We stopped at the Clewiston Inn for drink, in the bar they have a wonderful mural that was painted in 1945 and I had not seen it before. After our drink, we walked across the road to the movie theater and took in the latest James Bond movie: Quantum of Solace! The next day bright and early, we showed up for the start of the big O walk. I was only doing the "wimp walk" of the first 4 miles. Then they would shuttle me back to my car at the beginning. So we started off together. It was a beautiful sunny day and we quickly hiked the first couple of miles of the Big O together, then I left Ryan to finish the hike and I flew off to San Francisco! 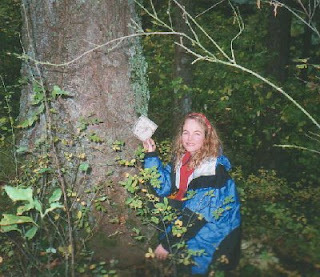 I just came across some old photos while cleaning out a closet and I thought they might serve as a cautionary tale to those of you letterboxing this autumn season. 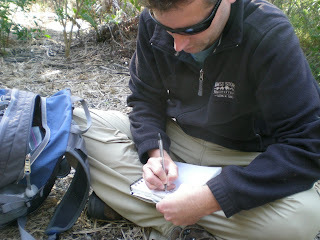 I was on the hunt for my 100th letterbox in October of 2001. 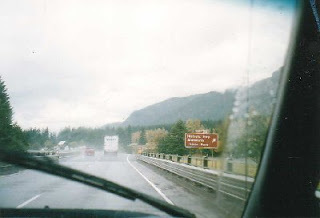 My sister had rented a car and we had driven down to the Columbia River Gorge to hike and letterbox. 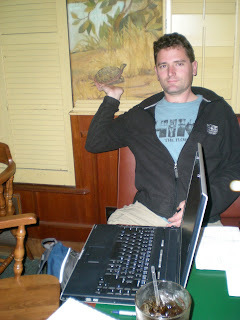 We were staying at the McMenamins Edgefield Inn in their hostel section. 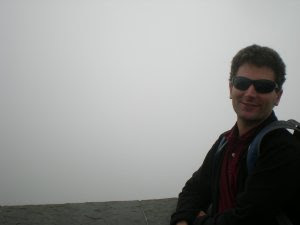 We had been having a terrific time, despite the rainy weather that year. 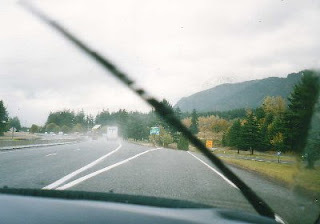 The weather all week had been rainy and damp. We were on our way to my 100th letterbox find. It was to be The Octopus Letterbox by Funhog on the hike to Horsetail Falls. We had already planned to eat at Tad's Chicken and Dumplings for dinner to celebrate my 100th Letterbox find. Then disaster struck! 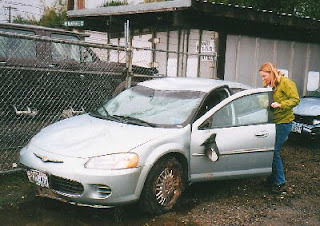 We hydroplaned off the highway exit ramp and flipped the rental car. 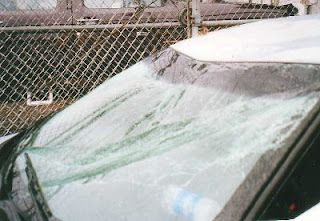 We were very very lucky and were not hurt at all. A fire engine had seen us flip and was on the scene almost immediately. Very cute, very young fire fighters, who were somewhat disappointed not to have to use the jaws of life to pry us from the vehicle helped us out of the ditch. 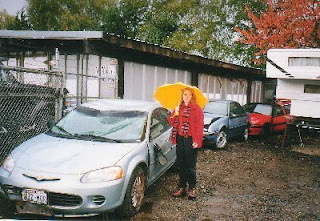 We waited in their rig for the cops to show up and then an Oregon State Trooper drove us back to McMenamin's Edgefield. Luckily, we have great insurance and the rental car people gave us another car the very next day and I was able to return to Horsetail Falls and find the Octopus Letterbox! So what do you do at a Nancy Drew convention? 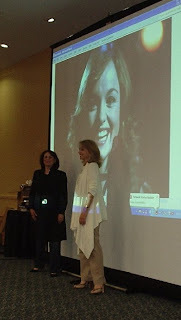 I just got back from Lancaster, PA and a whirlwind week at a Nancy Drew convention. I have been going to these book collector conventions since 1997 and the number one question I get asked is "What do you do at these conventions?" 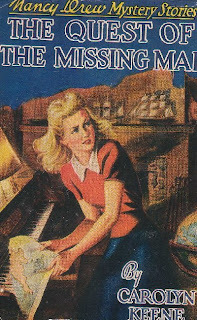 Well, in a nutshell, it is an opportunity for Nancy Drew collectors and enthusiasts to get together and talk about Nancy Drew. When I first started attending these things we would do a lot more book shopping. Ebay had not taken over the internet yet and used book stores and antique malls all over the country were a mecca for book collectors. 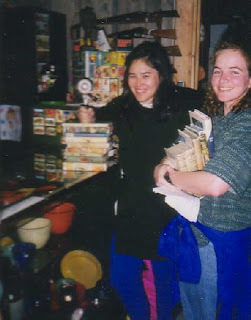 That's a photo of Lea and me at a convention in Maine in 1997 with some great finds at a dusty old book barn. We usually pick a location that can be tied into a Nancy Drew book location. 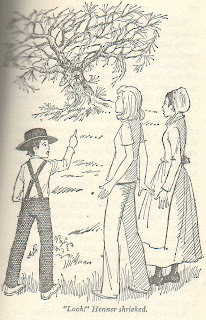 Lancaster, PA and Amish Country are the setting for The Witch Tree Symbol, Nancy Drew number 33. So we did things that Nancy did, saw the things that Nancy saw and ate the food that Nancy ate! 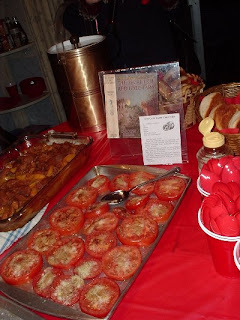 At a convention in the Chicago area in 2006, we had a buffet of foods that were taken right out of the text of the book, The Secret of Red Gate Farm. Last year when the Nancy Drew movie starring Emma Roberts was premiered, we had a convention in Hollywood. Some of the speakers at the convention were producers of the original ABC Nancy Drew TV show of the 1970's. 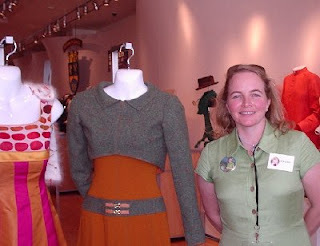 And we toured Warner Brothers Studios where the Nancy Drew movie was filmed, that's me with a display of the costumes that Emma Roberts wore for the movie! 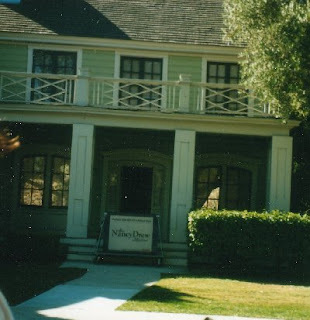 I also took the Universal Studios tour and saw the house that was used for the 70's TV show. 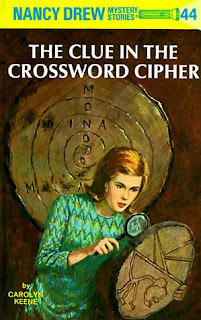 This year, we had Michael Cornelius chat about the book he edited, "Nancy Drew and her Sister Sleuths," a collection of essays on Girl Detectives in Fiction and also Penny Warner, the author of "The Official Nancy Drew Handbook". 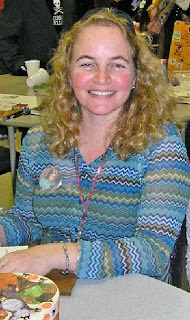 Another highlight of this years convention was the artist who did the cover art for several of the Nancy Drew Files during the 1990's, Tricia Zimic. She shared with us the process that she would go through to create the paintings that would then become the covers of the books. And occasionally, I have tried to dress as my favorite sleuth. 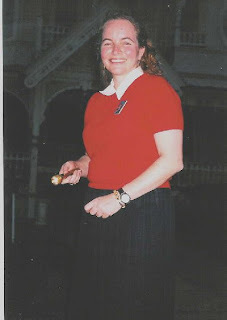 Here is a shot of me at a convention in Florida dressed as Nancy in "The Quest of the Missing Map," I also have a really cool blue shirt that matches the outfit that Nancy is shown wearing on the cover of "Clue in the Crossword Cipher." This year we toured an Amish Farm and visited Farmer's Markets and Quilt Shops. I found out that potatoes and pasta really are vegetables! And I tasted some of the best homemade rootbeer in the world. What your donations to WTA accomplish! Hike-a-thon 2008 is now over and we have raised $1600 for Washington Trails. Just to let you know what your dollars can accomplish, WTA sent me a breakdown of how they use the money. Ireland is 40 shades of green! But here are some more photos, this first one is of the street. If you have been to England where they drive on the left, there are often words like this as you step off the curb, reminding you to look right or look left. 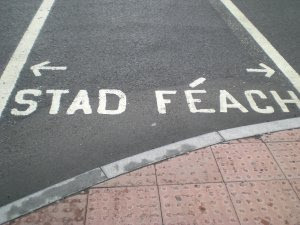 These words are in the Irish language and mean, Stop, Look. 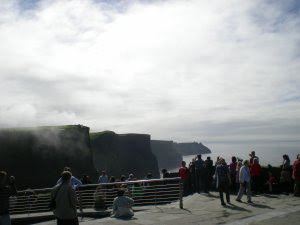 And of course we stopped at the Cliffs of Moher and at first the cliffs were totally socked in by fog. From this photo you can tell it was like a total white-out! Thanks so much for everyone's support this year! California Dreaming, I ain't Lion! 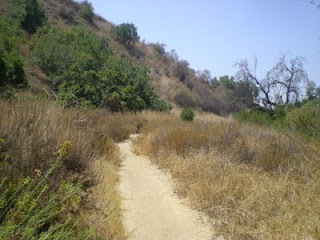 I had a layover in Los Angeles, CA and I was able to hike a few miles for hike-a-thon at the Carbon Canyon Regional Park in Brea, CA. My total mileage is now up to 53.5 miles. The Park is near the site of a former settlement called Olinda. Olinda was settled by farmers and ranchers in the 1800's. With the arrival of the Santa Fe Railroad, farmers and ranchers flocked to the area and cattle and sheep were pastured in the open fields which comprise the park. In the late 1800's the oil boom was on. A multiple of oil companies drilled in the foothills of Orange County. 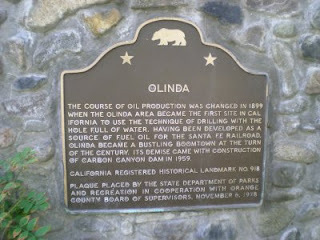 Olinda was an oil town with the oil company owning the houses, stores and the land. The area thrived as an oil boom town until the fields began to shut down in the 1940's. 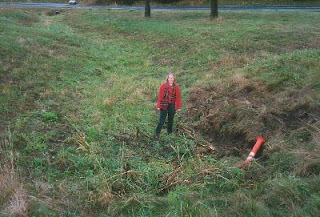 The park was created in 1975 after a dam was built at the mouth of the canyon for flood control in the 1960's. The last physical evidence of the community of Olinda became a memory with the development of the dam. The park is full of the flora and fauna of southern California. 2. Do not run because running stimulates a mountain lion's instinct to chase. Instead, stand and face the animal. 4. Do all you can to appear larger. Raise your arms. Open your jacket if you are wearing one. Keep everyone in your group together, appearing as one large shape to the lion. Wave your arms slowly and speak firmly in a loud, low voice. Convince the mountain lion that you are not prey and that you may be a danger to the lion. 5. Fight back if attacked. 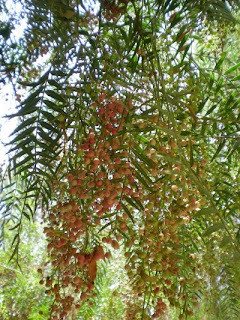 Throw stones, branches, or whatever you can reach without crouching or turning your back. 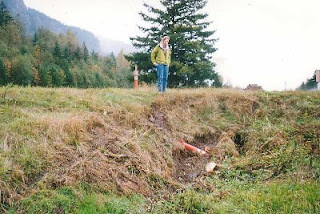 People have fought back successfully with rocks, sticks, tools, jackets, and their bare hands. Since a mountain lion usually tries to bite the head or neck, try to remain standing and face the attacking animal. Wildlife experts do not recommend that you play dead. Thanks so much to everyone who has supported me all month! Letterboxers, don't forget to send me your snail mail address so I can send you the Word of Mouth LTC. 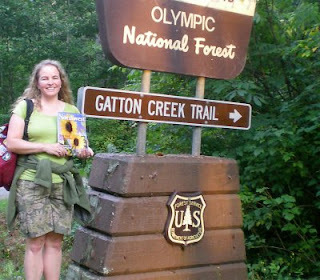 I had stopped by there last year on a hike-a-thon hike. It seems that each year, there is less and less of the bus left. Could it be rusting away? 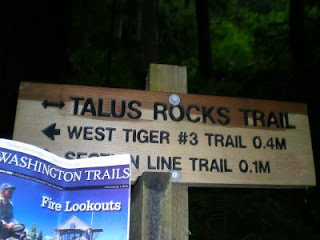 We hiked up to the Talus Rocks. I was wondering if this was a specific kind of rock....for example, what makes a talus rock different from a glacier erratic? Geologically, talus, or scree, is the accumulation of broken rock that lies on a steep mountainside or at the base of a cliff. 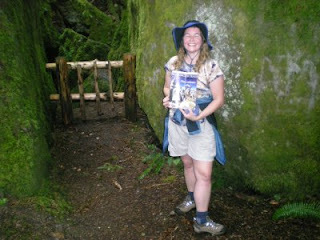 Ryan had heard of Talus Caves before, caves that are formed when rocks are piled up together. It seems that Talus Rocks could be Erratics. What makes them Talus is the way they are scattered along the sides of the mountain. 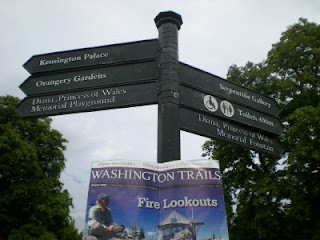 Then I flew off to London for work and took time out to hike along the Princess Diana Memorial Walk in Kensington Gardens and Hyde Park. According to wikipedia, "The Diana, Princess of Wales Memorial Walk is a 7-mile trail dedicated to the memory of Diana, Princess of Wales. 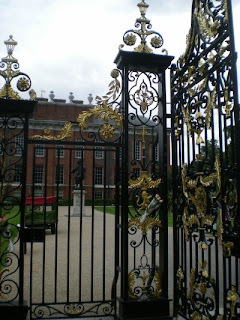 It goes between Kensington Gardens, Green Park, Hyde Park and St James's Park in a figure-eight pattern, passing five sites that are associated with her life: Kensington Palace, Spencer House, Buckingham Palace, St. James's Palace, and Clarence House. 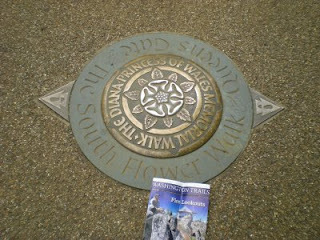 It is marked with eighty-nine individual plaques and has been described as "one of the most magnificent urban parkland walks in the world"." People still leave bouquets of flowers as tributes to Diana here at spots along the walk and by Kensington Palace. With the anniversary of her death approaching, (August 31, 1997) there were flowers stuck into the ornate black and gold palace gates. Ryan's Adventures 2004) On the Burke-Gilman Trail, as a walker, you are definitely in the minority--lots of bicycles! 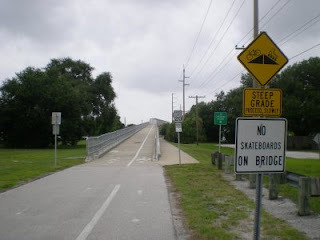 And in St. Petersburg, FL I was able to hike for 5 miles on The Pinellas Trail. Ryan did the entire trail in November 2006 while we were visiting my Dad in Florida. The only elevation you get is when there is an overpass over the busy highways. what's up with the magazine? 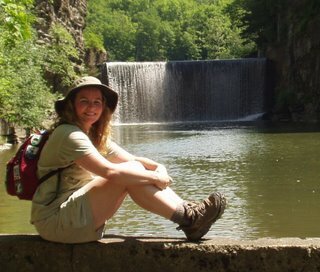 I have hiked 32.6 miles for hike-a-thon so far! 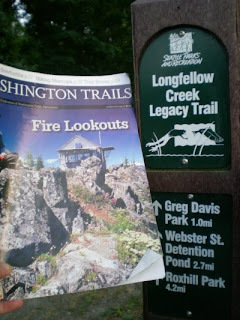 You might have noticed that I have a Washington Trails Magazine in the Photos about my hiking for hike-a-thon this year in my previous blog entries. 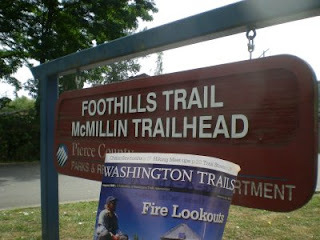 In order to prove that I have hiked the trails that I say I am hiking, I am required to take a picture with the August issue of the magazine. I take a ton of photos of all my hikes anyway for the blog, so this hasn't been that much trouble for me. UNTIL....until my sister and I were already on the ferry to the Olympic Peninsula and I figured out that I had left the Washington Trails Magazine at home. 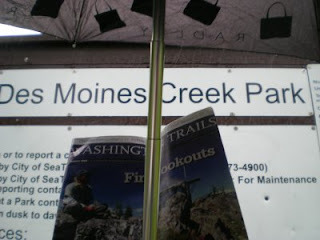 We stopped at a Fred Meyers and several other grocery stores as well as a couple of bookstores and local general stores in the towns of Port Orchard and Shelton on the Peninsula, but we could not find another issue of the WTA magazine to use while taking pictures. I figured since it was just to prove that I was hiking these trails during the month of August that I could find an emergency replacement. 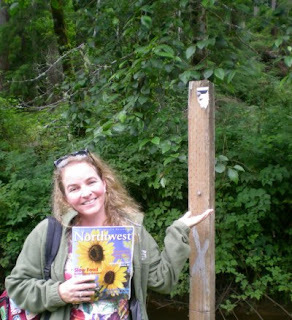 So we bought the August issue of Northwest Magazine with a lovely picture of sunflowers on the cover to use while we were on our trip to Lake Quinault. 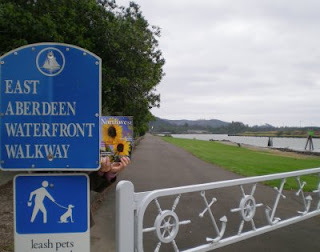 So the pictures in this blog entry will feature Northwest Magazine with Sunflowers. 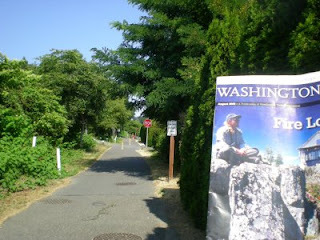 Our first hiking stop was at the Huff N Puff trail in Shelton, WA. 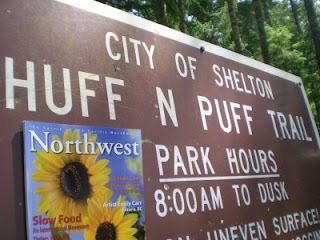 Gotta love a name like Huff-N-Puff for a trail! Although there wasn't much to Huff and Puff about, it was pretty tame as trails go. 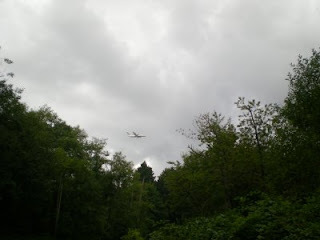 We spent the next two days camping and hiking around Lake Quinault. 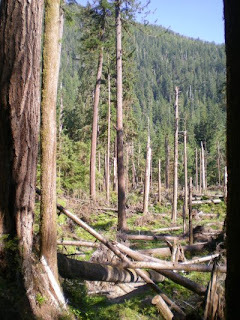 We discovered that there is still a lot of damage from the winter storms in this area of the Olympic National Park. 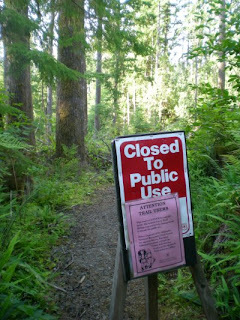 I hiked the Lake Quinault Loop and the Gatton Creek Trail. While hiking up past Irely Lake we encountered some folks doing trail work on that trail along Big Creek. 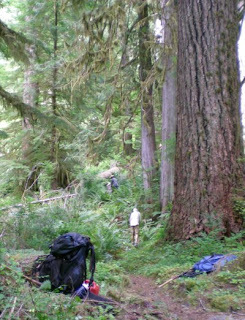 There were a lot of trees down over the trail and a couple of spots required us to scramble up and over as the trail disappeared around the debris. 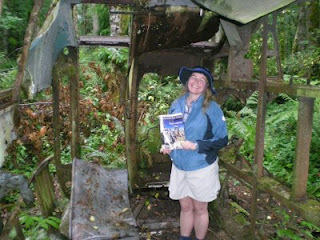 One of my favorite little hikes is at the Ranger Station on the north side of Lake Quinault. 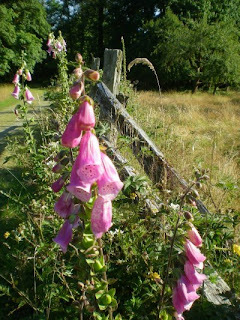 It is the Kestner Homestead Trail and takes you through an old homestead. A brochure at the beginning of the trail details what life was like on the homestead in the early 1900's. 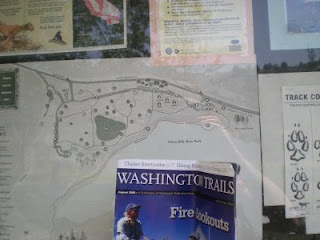 There is also the Maple Glade Trail at the same Ranger Station and it is a short little nature trail. 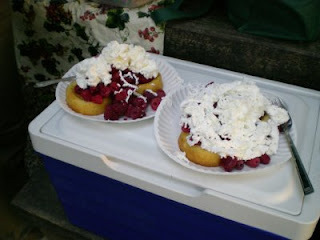 I have been trying to eat sensibly, but after dinner, I splurged on Raspberry Shortcake! On the way home to Seattle, we stopped in Aberdeen for a hearty breakfast at Duffy's restaurant. 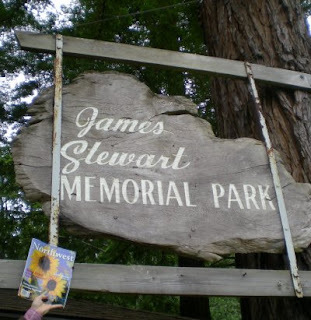 Later at the Stewart Park trail, the sign was missing so we compromised there with a shot of the park sign that is above the picnic pavilion. 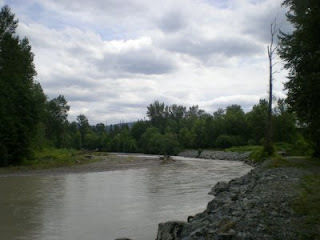 I also hiked along the Morrison Riverfront Walkway.